What’s the angle on fashion designer Claudia Li? 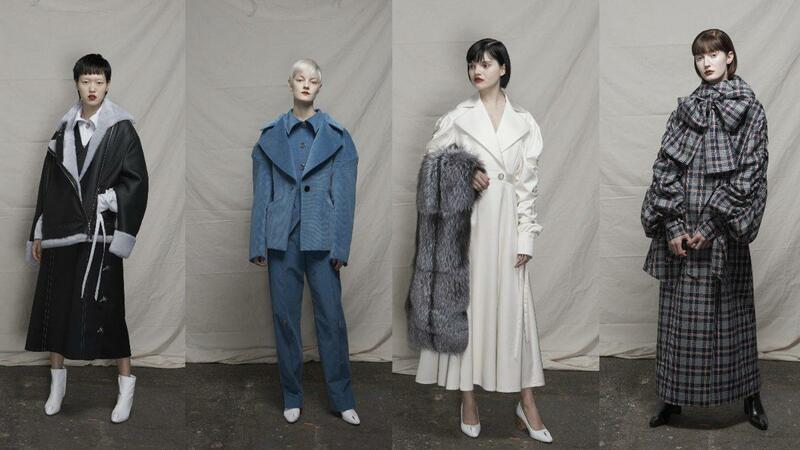 For the 2017 FORBES 30 Under 30 honoree, there’s nowhere to go but up with a mentor like British designer J.W.Anderson—and Li’s fall/winter 2017 collection is her most elevated work yet—literally, with models standing on three-foot-high mirrored podiums at her New York Fashion Week presentation. Showcasing her fourth NYFW season, Li, 27, is considered “older” for launching her own line. Her current collection reflects her journey growth as a designer. Speaking with Li before her presentation at Chelsea’s ArtBeam studios, there was a calm in her voice typically nonexistent during Fashion Week. The relaxed backstage environment she fostered reflected her collection’s ease and effortlessness. While Li’s designs emphasize the obscure angles of a woman’s body—elbow, shoulders, collars, knees, and wrists—the mirrors exaggerate the angles even more. Her fall/winter 2017 collection features the oversized silhouettes consistent in her previous lines—especially mid-calf cuts and bell sleeves. Li continues to incorporate her favorite fabrics, denim and dress-shirt, into several looks, but she also introduces refreshing pops of fur and corduroy. Though her aesthetic has always derived influence from menswear, this season infuses men’s tailoring even more—even though last September’s “feminist-floral” orchid-inspired line featured a few men’s looks (and even included a transgender model). These all-white ensembles were the two standout looks from Claudia Li’s fall/winter 2017 collection. This season’s hues—cerulean, orange, bold plaid—are much more saturated than the sorbet-pastel palettes of prior seasons. Despite Li’s use of strong colors, two all-white overcoat ensembles stole the show. The pristine jackets were draped over cream silk shirts with spiral puffed sleeves, but other pieces of outerwear were worn alone. A plaid raincoat with poncho detailing was particularly stunning, as was a khaki plaid jumpsuit worn like an overcoat. Li, whose collections have typically featured a soft pastel palette, experimented with plaid this season. 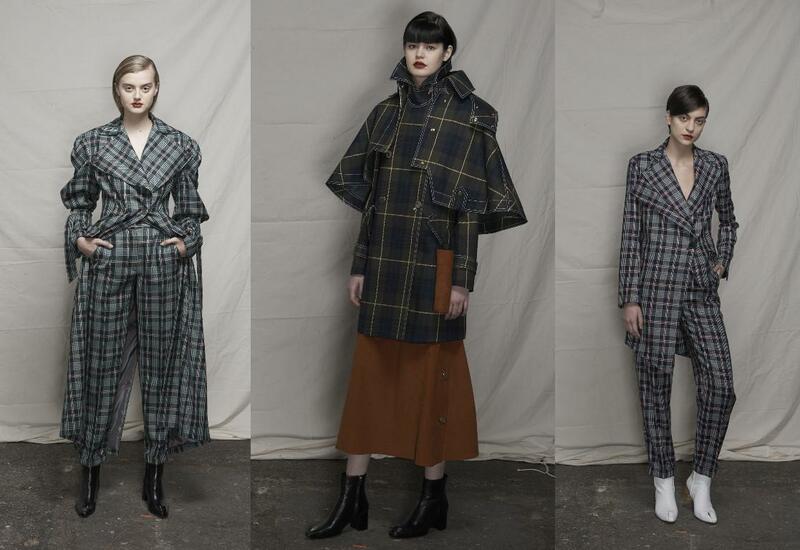 With pantsuits in vogue this season, Li took a modern, asymmetrical interpretation of the professional ensemble. One beige outfit fused the tracksuit with the pantsuit, merging work and leisure. 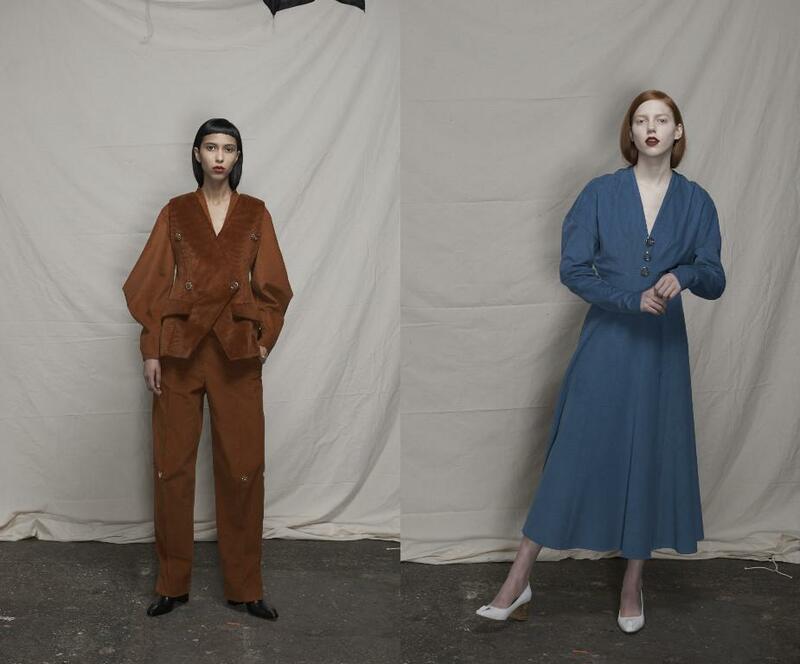 Claudia Li is bringing corduroy back into vogue. While velvet has been the sartorial statement of the season, Li takes the trend to another level—to corduroy, the ridged sibling of velvet. Mixing thick and thin cords, a blue flared dress with rounded shoulders and an orange blazer with pants peaked at the knees successfully reintroduced the textile into style.